We wake up some time between 7-9am depending on when Sam decides it’s time to be awake. I’m almost always in his bed with him when he wakes up (although he’s slept through the night on his own five times in the past couple weeks!). What’s really cute is that he will wake up before me but he just sorta lays there quietly until I make any sort of sign that I might be awake. I’ve played possum for half an hour or more after I’ve heard him wake up and he still will just wiggle around quietly in bed until I wake up, it’s super cute! However, once he thinks I might be awake, he pounces on me and gets right in my face and will say “Mommy! You waked up!” More recently that exclamation has been followed by “What you want for breakbast?” since that’s what I usually ask him first thing. It’s his way of cuing me to ask him what he would like for breakfast. So we head downstairs to go get some breakfast. Breakfast is usually cereal, although I usually give him a choice of what kinds of cereal. I’ve made him pancakes a few times but he mostly just picks at them. He’s not always good about staying focused on eating the cereal but he can go through a couple of small bowls of it if he’s concentrating :P I try to give him a Carnation Instant Breakfast (chocolate milk) for breakfast so that I know that he is at least getting full nutrition somewhere since he’s a pretty picky eater. I’ll usually sit at my computer (which is right there in the kitchen) and check my emails or work on dishes or try to do something productive while he eats. This of course means that we frequently end up with cereal dumped on the table if I don’t make him sit in his high chair. But, that’s part of life with a toddler, right? Either while Sam eats his breakfast, or once he’s finished (depending on where 9am falls in that spectrum) I let him turn on PBS Kids and watch SuperWHY, which has recently become his favorite show. I made the mistake the first few times he watched the show of making myself an integral part of the show for him. 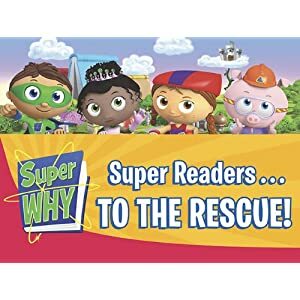 See, in the first 5 minutes of the show they all pull together and do a little cheer where they all put their hands in and then say “Super readers, to the rescue!” They tell the viewer to put their arm in too. I knew that Sam wouldn’t quite understand that at first so I would go over and put my hand out to him and do the cheer with him so that he would catch on to participating in the show (I figure it’s bad enough that I let him watch as much TV as I do, I should at least encourage him to participate). Well, now if I forget to do the cheer with him… it causes mini meltdowns. I should have known :P It’s pretty cute to watch him though. He loves the alphabet and words so it’s a great show for him to watch. I’m constantly amazed at how much he really does learn and pick up from the things he watches. After SuperWHY our activities vary. Sometimes (ok, so probably usually), I let him watch another show or two while I work on my computer. If it’s a laundry day then he comes and helps me do the laundry. He loves putting the clothes in the washer and dryer, and of course pushing the button to start the machines. He also likes helping me with loading/unloading the dishwasher, and his particular job is to put the soap in, and push the start button. I get in big trouble if I put the soap in the dishwasher myself or push the start button on any of our appliances now. You’d think he was Eric’s son or something :P Sam has recently started playing on his own with his toys, which is a HUGE breakthrough for us. His toys are upstairs in the loft and I’m usually working downstairs, and just that little bit of separation had been a no-go up until a few weeks ago. But now he’s content to do some coloring or playing with cars for an hour or so while I work on other things! Sometime during that time, Eric will wake up too and start getting ready for the day as well. Sam *loves* his dad and is always excited when he wakes up. If I can hear or anticipate when Eric’s alarm is going off I’ll bring Sam up so that he can wake up his dad the same way he wakes me up in the morning. You just can’t be sad to be awake when someone is so excited to see you! Usually once Eric is really awake, we’ll all jump into the shower together (and of course, the youngest among us is upset if Eric showers without him) and then get ready for the day. Then we send Eric off to work, or sequester him in his study so that he can work with as little interruption as possible. Around noon we’ll stop and have some lunch. Sam is pretty picky about what he’ll actually eat so our lunch options are pretty limited. Even though he’ll request things like strawberries or sushi, he generally won’t actually touch them once they’re on his tray. The things he does eat are mac & cheese, hot dogs, quesadillas, or a ham & cheese sandwich. Although, his definition of ham and cheese sandwich is probably not quite the norm. He has to have a slice of ham and cheese on bread, but he eats all the pieces separately (usually requesting more ham or cheese) and almost never actually eats the bread. He’s started to eat slices of apples when I give them to him. He requests to eat them with peanut butter, like I do, but if I put peanut butter on the apple he will then refuse to eat the apple and instead wants me to eat it. This is actually his reaction to just about any sort of topping or sauce. He sees us eat it and likes dipping things… but then he doesn’t want to eat it and will make you eat it instead. So we’ve stopped offering him ketchup or butter or anything that you could think of to add to a dish. It’s more hassle than it’s worth. Naptime right now is a variable. For awhile he’d been going down pretty consistently at 1pm, but then he started fighting it pretty hard and wouldn’t really go down until 2, 3 or even 4pm. He’s tried skipping a nap altogether but he ends up getting super cranky and crashing around 6pm if he does that, which of course means that bedtime is messed up and no one is happy. He’s been sick for the past week so I’ve been letting him nap in my arms in the rocking chair while I watch TV (which means that he will consistently nap for 3+ hours instead of 1 hour, which I figure is the most important thing with a sick kid is to let them get sleep at whatever cost). Hopefully before the baby comes we can get him better and get back on a really solid schedule so we can figure out what his naptime ought to be right now. I think we might be tending towards a shorter nap and an earlier bedtime. Depending on when he goes down he will sleep from 1-3 hours on his own (3 if I put him down later) but regardless of how long he sleeps it doesn’t seem to mess with his bedtime so I think he probably really needs the 3 hours of sleep in the afternoon. I try to use this time to get some programming or dishes or something useful done, but it’s hard with it being such a variable length of time. Depending on how much sleep I got the night before I will often just lay down with Sam as well, which means that he will sleep longer, but obviously decreases my productivity in a day pretty drastically. When he gets up we do more playing/chores/whatever. Around 4 or 5pm I start bugging Eric over IM to find out when he’s coming home or when he’ll want dinner (if he’s just up in the study). Ideally I’d love for us to have dinner every night at about 6:30pm *hint hint ;) * but sometimes if Eric has gotten up late or is busy with projects or whatever so… it doesn’t always happen. Dinner is usually whenever Eric gets home and is sometimes as late as 8 or 9. We usually will watch a TV show as a family while we watch TV, although I’ve tried a few times to get us out of that routine and having more of a real family dinner but we keep falling back into the bad habit of watching TV instead of talking. Sam is (of course) kinda picky about what he will and won’t eat. He doesn’t really refuse different foods, he just won’t eat things if they aren’t on his approved list :P His favorite food is tortellini (without sauce of course), but he also likes plain rice or noodles, mixed veggies, rolls (if we break it into pieces for him first), cheese… and that’s really about it. Often I’ll end up making him a hot dog or something just so that he eats at dinner, but I’d really like to be feeding him the real yummy food that his dad and I are eating. Oh well, baby steps right? Our goal is to have Sam in bed every night between 9 and 10pm. So usually around 9pm we’ll try to stop what we’re doing and give Sam what we call his “rough housing time”. Basically we want to run out the remainder of his energy before he goes to bed. Ideally this is also his dad time and they can play some basketball together or wrestle or play cars… yaknow, boy stuff :) Sam is also content often to just run laps. We’ll have him run to Eric, then to the couch, then to Eric, and back to the couch for as long as he’ll keep going. It sounds dumb, but he really enjoys it! He has a bedtime routine that we follow pretty strictly, although we’re not always as strict about the exact timing. If we do things out of order though we’re toast. So first we’ll change his diaper and put on his pajamas. He’s started to be really mad at me if I throw his diaper away (that’s his job), and he’s lately taken to fighting putting the new diaper on. He’s really funny about his diaper changing routine in general though. We lay out a towel on the floor (which he often has to straighten and get just so), then he’ll go to the far end of the towel and say “beep beep beep beep” like a truck that’s backing up, and slowly come over to me. Then I have to lay him down and try to get the old diaper off and the new diaper on before he realizes that the new one is on (this almost never happens unless I have Eric there reading him a story or keeping him distracted). Then he has to throw the diaper away in the diaper genie himself, and if his clean diaper isn’t on yet then we negotiate to get the new diaper on. I’ve made the mistake of throwing the diaper away myself, and the meltdown was not pretty. He also frequently will request “cream” (diaper cream), even if he doesn’t need it. So sometimes we just appease him and put a small amount of diaper cream on his bum cheeks. We figure it doesn’t hurt to put it on, and if that’s all it takes to get the diaper on… that’s not that big of a deal. Once the diaper is changed then we put his pajamas on and hop into bed. He’s also become picky lately about which pajamas he wears each night, and he likes to put them on himself, as much as he can. If they’re pajamas that zip up Sam has to zip them up. If they’re separate tops and bottoms he insists on pulling the pants up himself. I figure those are at least good things for him to learn to do so I try to remember to not get in his way :P When we hop into bed it’s story time. Depending on time constraints we’ll read him just about as many stories as he wants. Sometimes it’s 1, sometimes it’s 7. Sam *loves* reading stories and has several that he pretty much has memorized, so he often does almost as much of the reading as we do. It doesn’t matter how many stories we read, but it does matter that when we start the last story that we declare that this is “last story”. Sam’s still not always happy when story time is over, but if it’s at least been declared in advance there is less mutiny when we finish. Then it’s time for scriptures. If I’ve been reading the stories with Sam then Sam will start calling out “Eric? Want read scriptures wif us?” and he’ll often run out of the room to go find his dad. For scriptures we turn off the lights and just listen to a chapter on Eric’s phone while we snuggle. At the end of our chapter we always say “So let it be written, so let it be done” and thump our chests a la Pharaoh in The Ten Commandments. This is a tradition from my family, and no one knows why we started doing it, but we also don’t question it anymore. It’s tradition! Sam had been really good at participating in our strange tradition… until recently. Now when we get to the end he almost always asks “more chapter?” Sometimes we’ll appease him and listen to another chapter of the scriptures (because it’s hard to justify refusing to let your child listen to more scriptures), but most of the time we’ll tell him no and move on to family prayers. Once again Sam is particular on how we do family prayers. We have to be kneeling on the same side of the bed, with dad closer to the wall, and Sam on mom’s lap. He also starts getting finicky if we lean against the bed, apparently that’s not allowed. Of course, he’s not exactly a model of good behavior during prayers. He will sit on my lap for a little bit, but then he sometimes roams the room or even leaves. I’m sure at some point that will be a major infraction, but for now we’re just happy if he’s being quiet and pretty happy if he’ll go off on his own anyways :P Usually once we’ve finished prayers Sam insists on saying his own prayer. His prayers are SO sweet and they always crack us up. What’s cute is that he actually knows how to say the prayer, but we have to repeat what he’s saying rather than the other way around. It’s his way of making sure we understand what he’s saying. His prayers ALWAYS include “bless safe” (bless us to be safe), but other than that, he just says whatever is on his mind. We do lots of thank yous. Last night we were thankful for plates and cups and hot dogs and goldfish. One night he was more thankful for underwear than his dad. One night he was thankful for headphones, hot dogs and his Aunt Taylor (Taylor said she was honored to be counted among hot dogs and headphones – that’s high praise from Sam!). We love listening to him pray and hope he always keeps his love of praying. Once we’ve finished with prayers then Sam will give his dad a hug and kiss goodnight, and he usually will tell him “Daddy work!” because for awhile Eric had to go back to working after we’d finished our bedtime routine, and so now Daddy working is just part of the routine… even if Eric really goes into the office to play a game instead. Then Sam and I will snuggle. I’ve recently limited his snuggling time to 5 minutes, which we count down. I tell him, “Ok, we can snuggle for 5 minutes…. Ok, 4 more minutes… 3 more minutes… 2 more minutes…. 1 more minute, last minute” I make him acknowledge the “last minute” if he’s still awake because he doesn’t fight things being over as much if we’ve already given him fair warning of it being “last”. After his 5 minutes of snuggling are up we do “last big hug” and “last big kiss” and then I move to either the other side of the bed or a chair next to his bed. The deal at that point is that I will stay while he falls asleep and hold his hand, but no more snuggling. He now knows that if he requests more snuggling/hugs/kisses after we’ve done the last snuggles that I’ll tell him it’s the end. So sometimes he’ll ask and then immediately say “no, end of hugs”, “no, end of kisses”. It’s pretty cute to see his mental processes play out. I feel really witchy withholding snuggling from my cute toddler, but if he had it his way I would just snuggle him all night, which means I get kicked in the stomach all night – not pleasant when you’re 8 months pregnant. He sleeps right now with a whole menagerie of animals – 2 monkeys, a puppy, a panda, and a kangaroo – and he will usually put them all on one pillow and himself on the other pillow. He of course gets picky about which pillow he sleeps on, but he’s not always consistent about which pillow it actually is. He also has a sippy cup of water that he gets whenever he’s going to sleep. In the past he would request juice or milk before bed, but then he started to request juice and milk and water right after each other to delay going to bed. So finally we made the rule that when Sam’s going to bed he only gets water. Sometimes he’ll request juice or milk before bed and then will correct himself, “no juice, just only water”. Once Sam is asleep I’m free! I go change into my pajamas and usually spend a little time catching up on Facebook or Twitter or Words with Friends in bed before I go to sleep. Occasionally Eric and I will have a “date”, aka going downstairs and watching a TV show on our own. Around midnight we go to sleep as well. Then some time during the night, usually around 3-4am Sam will wake up and call for me until I come. I’ve established that I’ll come give him some hugs and love, but then mom stays on the other side of the bed and we’re not snuggling for the rest of the night. This is a recent development and it’s made a HUGE difference for me so that he’s not kicking my belly all night or edging me out of the bed. Of course, these past couple weeks it’s been even better and he hasn’t called to me until 8am which is AMAZING, and definitely the goal. My goal is really to just give him some snuggles and love and then go back to my own bed, but usually I’m too tired to be good about going back to my own bed and it’s easier to just lay down and sleep in Sam’s room. My mom has requested that I try to post more mini-posts about things that happen in day-to-day life rather than my big novel length posts. She usually gets to hear about our mini-adventures because I’ll call her and tell her about them, but she’s right, I should record and share them here. So I’m going to make an attempt to write more short posts about our adventures in the future. Uhm, yeah, that would be cheese and corn chex. We’re not quite that desperate for ingredients… but whatever rocks your canoe dude. Thank you for Mom, and for Underwear…and for Dad. (troubleshooting our connection) Hear us? Hear us? (after we finish reading a chapter) More chapters? Play Angry Birds! Play Fruit Ninja!